This fixed income fund has an average coupon of 4.72%. Top 10 bond sectors are Health Care, Tax Obligation/Limited, Transportation, US Guaranteed, Tax Obligation/General, Water and Sewer, Education and Civic Organ, Utilities, Consumer Staples, and Long Term Care. Top 5 states are California, Texas, Illinois, Florida, and Colorado. 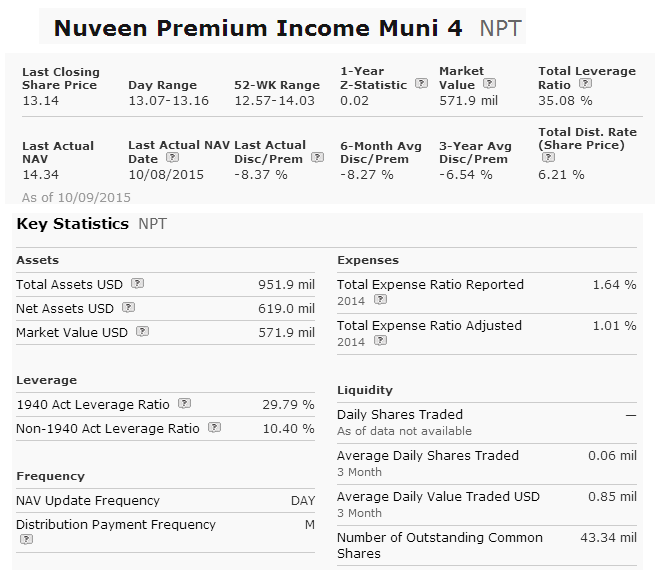 This Nuveen Premium Income Municipal Fund 4 (NPT) is highly rated by Morningstar. It has decent returns for the past 5 years. Its expense fee is slightly higher than typical bond fund. 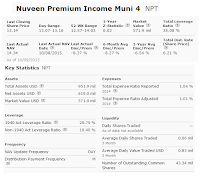 Note: Nuveen Premium Income Municipal Fund 4 (NPT) was merged into Nuveen Enhanced Municipal Credit Opportunities Fund (NZF).